The William and Linda Stavropoulos Family Foundation of Midland, Michigan, has made a $10 million gift to the University of Notre Dame for the creation of a center specializing in biophysical research in the College of Science. Physics has played an important role in biological research for many years, with the most well-known example being the work of James Watson, Francis Crick, Maurice Wilkins and Rosalind Franklin in the discovery of the DNA double helix. The intersection of biology and physics has increased dramatically in recent years as the important questions in biology have become more fundamental in nature. 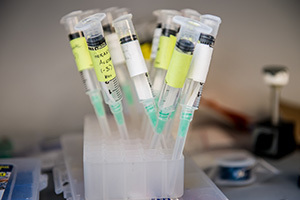 The Stavropoulos Center for Interdisciplinary Biophysics will bring to Notre Dame thought leaders focused on the connections between physics, biology and medicine who will engage with physicists, biologists, chemists, mathematicians and engineers. This group will work jointly to pursue novel approaches to cancer, stem cell biology, imaging, therapeutic development and other research topics. Bill Stavropoulos has served on Notre Dame’s College of Science Advisory Council since 1988. Stavropoulos earned a bachelor’s degree in pharmacy from Fordham University and a doctorate in medical chemistry from the University of Washington. He began his 39-year career at The Dow Chemical Company as a research chemist and held a variety of research and management positions until becoming chief operating officer in 1992 and chief executive officer in 1995. He served as chairman and CEO from 2002 to 2004. Stavropoulos is involved in a variety of corporate ventures. He is a trustee of the Fidelity Equity and High Income Funds Board, a director of Teradata Corp., operating adviser to Clayton, Dublier and Rice LLC, and a member of the advisory board for Metalmark Capital LLC. He is president and founder of the social enterprise the Michigan Baseball Foundation, and the Class A minor league baseball team in Midland, the Great Lake Loons. His numerous honors include the Ellis Island Medal of Honor and the Société de Chimie Industrielle’s Palladium Medal. Linda Stavropoulos, a former schoolteacher, serves as president of the William and Linda Stavropoulos Family Foundation, which the couple created to support efforts in health care, human services, higher education and religion. Their two children, Bill and Angela, are both Notre Dame graduates. They have six grandchildren, and reside in Naples, Florida.